4" Trophy Truck Case - Gearworks Inc. 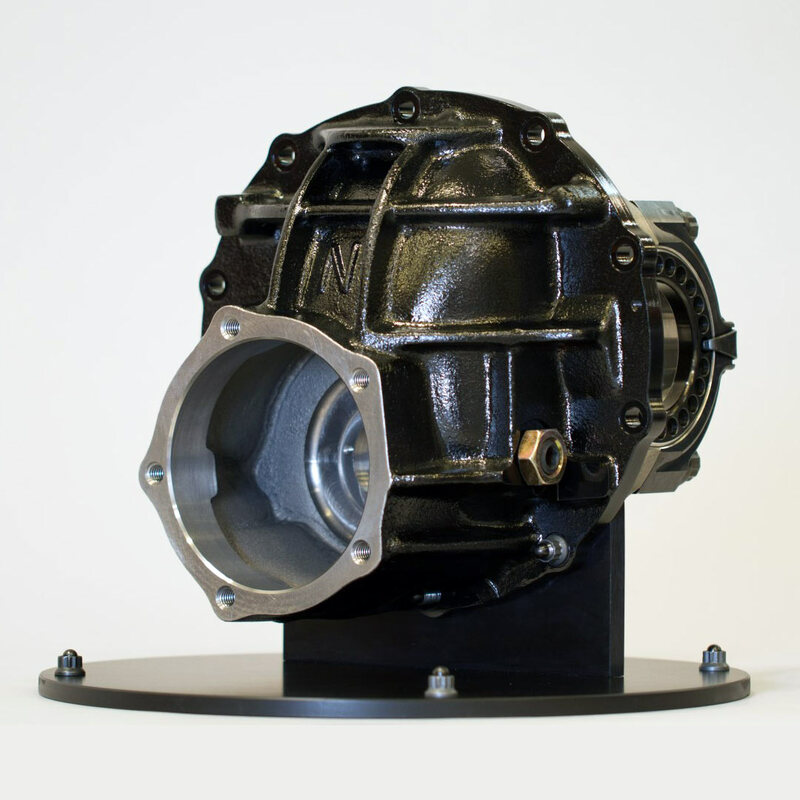 The GearWorks 4 inch bearing bore case assembly is another GearWorks improved product. It features 4 inch carrier bearing capacity, to support 2.375” 36 spline or 2.562” 40 spline spools. 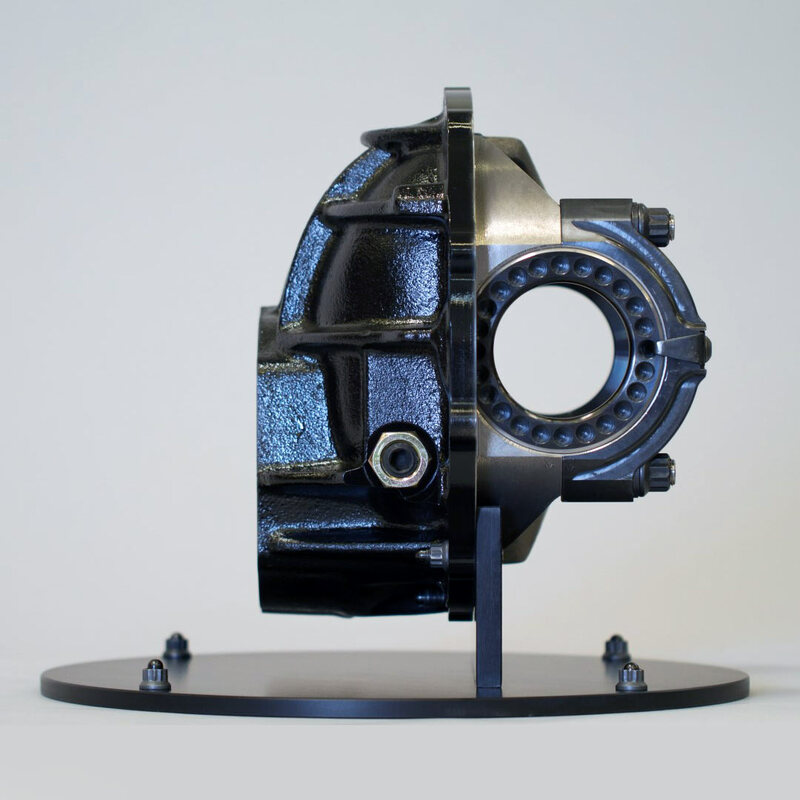 Additionally it has a load bearing bolt to back up the ring gear in the event of case or gear deflection under severe use to insure the gear set maintains correct running geometry in trying times. 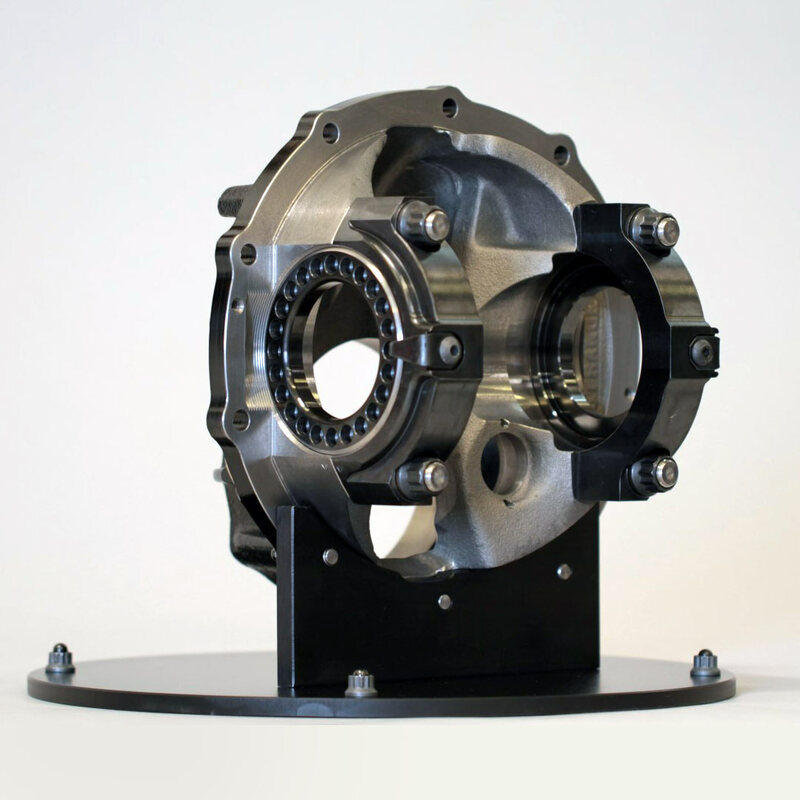 The GearWorks 4 inch bearing bore case assembly is another GearWorks improved product. It features 4 inch carrier bearing capacity, to support 2.375” 36 spline or 2.562” 40 spline spools. Additionally it has a load bearing bolt to back up the ring gear in the event of case or gear deflection under severe use to insure the gear set maintains correct running geometry in trying times. 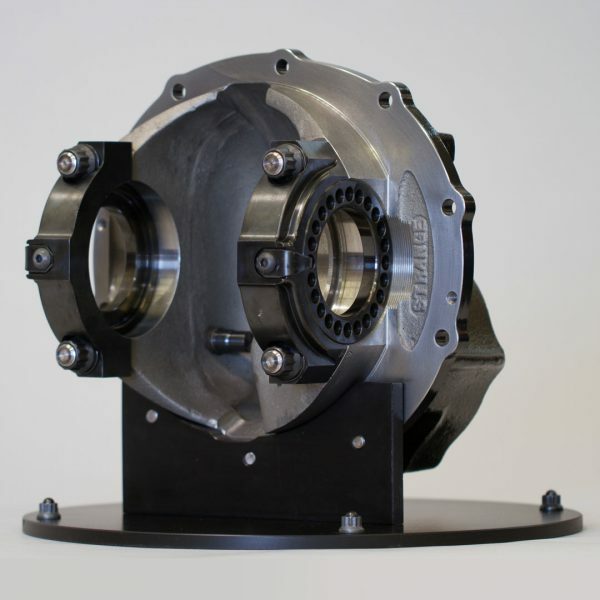 The GearWorks 4” case assembly uses an industry standard (not automotive) longer pinion pocket bearing for additional pinion support with a bearing retainer plate secured with three countersunk socket head cap screws. In a pinch you can use the standard 9” Ford pocket bearing and press in retainer. To guard against deflection, spanner nut ejection and subsequent gear failure the main bearing caps and spanner nuts are made from chromoly steel as opposed to aluminum. Held Tight by massive 9/16″ ARP studs and harware. The case is CNC machined to clear a ring gear with a true outer diameter of 9.500” Unseen are two set screws at the 3 and 9 O’clock position usable to jack the case assembly out of the axle housing should it be stuck, and four of the five 7/16″ pinion support bolt holes are drilled and tapped blind to avoid sealing issues when a pinion support mounted skid plate is used. 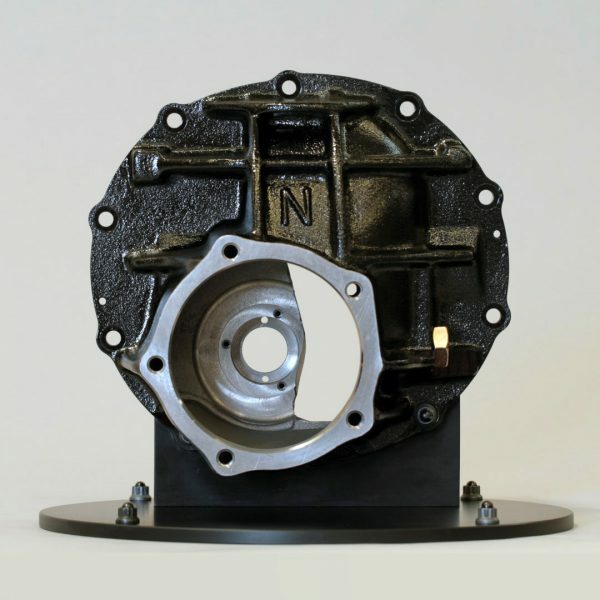 We also have iron cases with 3.812” and 3.25” bore, with all the above features.